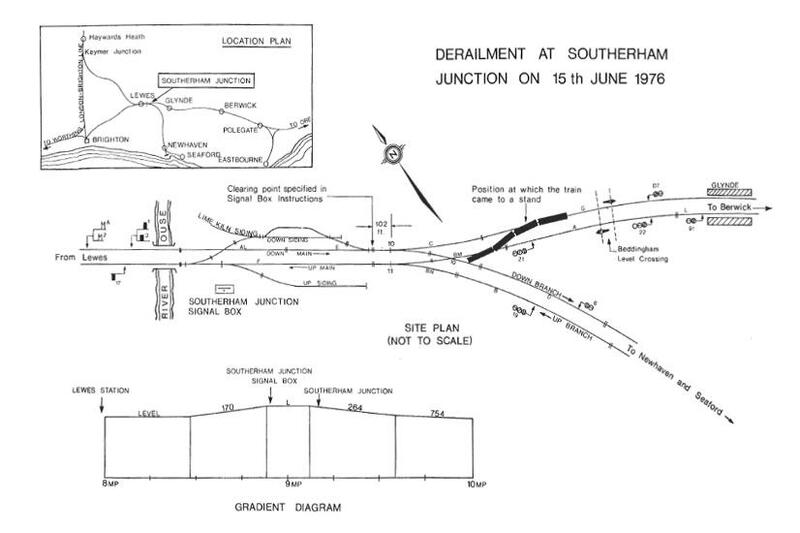 On the 15th June 1976, a derailment of a passenger train occurred at Southerham Junction, near Lewes, in the Southern Region of British Railways. At approximately 19.09 on Tuesday, 15th June 1976, as the 18.44 electric multiple-unit passenger train from Brighton to Ore, formed of a four coach unit, was passing over Southerham Junction, about a mile to the east of Lewes, the facing points were moved under the second coach and the train became derailed. The train, which had been traveling at between 35 and 40 mile/h, was brought to a stand a short distance beyond the junction with all its coaches upright and coupled together hut with its rear three coaches derailed and spread across the opposite line. The points were free to be moved because the signalman on duty at Southerham Junction had rendered the interlocking inoperative by the irregular use of a release key. The lines were protected and the emergency services were called and arrived quickly on the scene. The train was well filled but luckily none of the passengers was injured although five were taken to hospital suffering from shock, being allowed home after treatment. In addition, the guard received slight injuries to his ribs and back, hut did not attend hospital, and the signalman at the nearby signal box collapsed when being interviewed shortly after the accident and was taken to hospital where he was detained overnight. The accident caused the electric traction current to be discharged from the 750 V DC conductor rail system and this brought trains to a stand in the Lewes area. Whilst the train was being re-railed and the track repaired at Southerham Junction, bus services were operated to convey passengers between Lewes, Berwick, and Newhaven. The main line from Lewes to Eastbourne and Hastings was handed back to traffic at 16.26 on Wednesday, 16th June but the Newhaven and Seaford branch was not reopened until 05.40 on Friday, 18th June. At the time of the accident it was still daylight and the weather was fine and clear. Southerham Junction lies approximately one mile east of Lewes Station and is the point where the branch line to Newhaven and Seaford leaves the main Lewes-Hastings line. Until April 1976 the junction was located immediately opposite Southerham Junction Signal Box but in that month it was repositioned about 500 yards further to the east, that is on the Eastbourne side of the signal box. This relocation, together with associated alterations to and simplification of the permanent way, was part of a scheme which included the eventual closure of the junction signal box and the transfer of control of the junction to Lewes Signal Box. The scheme itself stemmed from plans to build a road by-pass to the east of Lewes which involved a bridge crossing the railway immediately over the junction signal box and at a height which required the removal or complete rebuilding of the box. The relocated junction was laid in new 113 lb/yard flat bottom material to vertical design and was thus in virtually 'as new' condition at the time of the accident. A plan showing the new junction and its approaches together with the gradients and the layout of signals and track circuits is at the front of the report. At the time of the accident the signalling in the junction area was controlled by Southerham Junction Signal Box. The box was equipped with a mechanical interlocking frame working mechanical semaphore signals in the immediate area of the junction, and it regulated trains between signal boxes at Lewes, Berwick, and Newhaven Town. The block systems in use were Three Position Open Block on the Up and Down lines to Lewes and on the Down line to Berwick, Track Circuit Block on the Up line to Berwick, and Tyers Block on the Up and Down Branch lines to Newhaven Town. As an interim arrangement, the electric point machines operating the relocated junction points were controlled by the movement of the appropriate point lever in the signalling frame and, in addition, track circuits installed as part of the eventual remotely controlled signalling were used to give electrical interlocking of certain of the points and signals and were indicated on a new illuminated diagram in the signal box. The alterations in the working of the signal box necessitated by these changes were incorporated in special "Instructions to Signalmen at Southerham Junction Signal Box" which came into force on Sunday, 4th April 1976 and which were displayed in the box. In the circumstances of the accident under inquiry, the most important of the changes contained in these special instructions was that relating to Regulation 4 of the "Regulations for Train Signalling on Double Lines by the Absolute Block System": the instruction stated that, on the Down line, the clearing point (i.e. the point marking the distance beyond the home signal which must be clear of trains before another train can be allowed to approach from the box in rear) was to be the Berwick end of track circuit 'E'. Under the Open Block system in operation between Lewes and Southerham Junction, the signalman accepted a train from Lewes by placing his block instrument to 'line clear'. To be able to do this be must first have replaced the relevant home signal (l or 3) to Danger and distant signal (A or 2) to Caution after the passage of the previous train. With the Southerham Junction instrument at 'line clear' the signalman at Lewes could then clear his starting signal and allow the train to proceed up to the home signal at Southerham Junction. Clearance of his home signal by the signalman at Southerham Junction required proof that the relevant track circuits (AL, E, C, and G for a train proceeding towards Berwick on the Down main line) were clear and that the points were correctly set and detected for the route concerned. When pulled, the lever controlling the home signal was back-locked electrically, the back-lock being released by the train's occupying track circuits 'E' and 'C' sequentially. This meant that, under normal conditions, the signalman could not replace the home signal lever in the frame, and hence be in a position to accept a second train, until the first train had occupied track circuit 'C'. He was also required to observe Section C.4.5.2 of the British Railways Rule Book, which reads: "The Signalman must replace a stop signal to Danger immediately the last vehicle of a train has passed it, except that at a junction the signal immediately in rear of and protecting such junction must not be placed to Danger until the last vehicle has cleared the junction points." "At certain signal boxes . . . where a signal lever is back-locked, a release key is provided in order to release the back-lock in the event of a failure of the appropriate treadle or track circuit to effect the release, or a train being cancelled after the signal has been lowered. These keys must not be used until the signalman has satisfied himself that such a release is necessary and can be given with safety. The release keys must not, in any circumstance, be allowed to remain in the keyhole and must he kept in the prescribed place." As regards the operation of the junction points (No. 101, occupation of track circuit 'C' by a train locked the point lever, either Normal or Reverse, in the frame and thus prevented any movement of the points. Track circuit 'C' commences 102 ft before the toe of the facing points. Reversing the lever required track circuits 'C' and 'BM' clear, and locked signals I and 21 at Danger. The point lever itself was a normalized one and, until April 1976, it had worked the points mechanically through rodding: with the changeover to electric operation of the points, however, it needed only to make and break electrical contacts and its operation thus became much lighter. Normally, under these conditions, the lever would have been shortened to distinguish it from those still operating mechanically, but this was not done since the arrangement was a short term one to cover the period until the signal box was closed. In operating it from the Normal position, the first 21 in of movement served to clear the Normal lock and, after a total of 7 in movement, the electric point motors would start to move the points. At this stage the lever would be free of any interlocking although replacement of it towards the Normal position would stop the operation of the point motors. If, however, it was pulled towards the Reverse position, the Reverse lock would become effective when the lever was just under 4 in from the fully reversed position. The train was Class 42/11 four-car Unit (4CIG) No. 7303, comprising a Driving Trailer Composite at each end and, in the centre, a Motor Brake Second Saloon and a Trailer Second Saloon. The stock was of modern design, the class having been introduced in 1964. The train was signalled correctly through the junction on the Down main line and approached the junction under power at between 35 and 40 mile/h. sometime after the leading coach had passed correctly over the facing points (No. 10A) the point motors started to operate under the second coach and the trailing bogie of this coach struck the partially open points and was diverted onto the branch line. This caused the second coach to slew sideways out of line until its rear bogie was forced into derailment and dragged across the junction, seriously damaging the switch diamonds. The third and fourth coaches were similarly dragged into derailment. Meanwhile the driver had felt the effects of the derailment and had made a gentle brake application, and the guard had used his brake handle to make a full emergency application. The train stopped just beyond the junction, in the position shown on the drawing. The second, third, and fourth coaches each sustained damage to their bogies and wheels, and to various parts of the under floor gear, head stocks, brake pipes, step boards etc. On the ground there was extensive damage to the permanent way, part of the switch and crossing work at the junction needing replacement together with some 300 yards of plain track, and to signalling and electric traction line side equipment. The driver of the train was Driver W. A. Mullett. He had hooked on duty at 16.08 and, after working a train from Seaford to Haywards Heath, he had travelled to Brighton to work the 18.44 Brighton to Ore. The train left on time but was delayed at the Lewes Home signal and was in consequence some seven or eight minutes late in leaving Lewes. The Down Main Distant signal for Southerham Junction (Signal A) was in the 'on' position, but when the Down Main Home signal (Signal 1) came into view it was clear. The train was coasting at about 35 mile/h as it passed the signal box and Driver Mullett re-applied power at this point. Approaching the re-positioned junction he was looking ahead down the line and did not consciously look at the junction points. The front of the train ran smoothly through the junction but having proceeded about a coach length past the facing points there was a sudden violent oscillation and a noise from the rear part of the train. Mullett thought at once that the train bad become derailed and he made a gentle brake application, knowing that an emergency application would probably make matters worse. The train slowed but was then stopped by a full emergency application made by the guard from his own brake position. After conferring with his guard, Driver Mullett went forward to protect the obstruction. He attempted to contact the signal box from the first Up line signal (No. 21), which was at Danger, but the telephone was 'dead' so he continued to Beddingham automatic half-barrier level crossing where the barriers were down and the red lights were flashing but the telephones here were also out of action. An Up train was at a stand at the stop signal on the Eastbourne side of the crossing. The driver's evidence was confirmed by his guard, Guard L. C. Hough. He had applied his brake after feeling the train rock violently just after entering the junction. After protecting the train from the rear he had gone to the signal box to confirm that all the protecting signals were at Danger and that the traction current had been removed. The signalman had appeared calm and capable of dealing with the situation. Hough had then returned to the train and assisted in detraining the passengers. The signalman on duty at Lewes Signal Box was Signalman D. H. Colwell. He had moved to the Lewes box in September 1975 after spending just over 14 years working in Southerham Junction Signal Box. He had been replaced at Southerham by Signalman Russell whom he had first met when Russell had been appointed to the box at Southease, on the Seaford branch. He had found him to be a civil young man but on one occasion, when he was still at Southerham Junction, he had been annoyed because Russell was delaying traffic by not giving the 'Train out of section' bell signal at Southease when he could well have done so. Words had passed between them. On the day of the accident, Colwell booked on duty at 14.00 and from then until about 19.00 the work in the signal box was routine. The period around 19.00 was always a busy one and on this occasion some trains were running late. At 19.00 Colwell telephoned Signalman Russell at Southerham Junction because be seemed to be somewhat slow in giving the 'Train out of section' bell and he, Colwell, was anxious to keep traffic moving. As far as be could remember, Russell had told him that he was having trouble with his track circuits and that the barriers at Beddingham level crossing were down. At this time the 18.44 ex Brighton train was standing in the station waiting for a late running London train to clear the section to Southerham Junction. At 19.05 Colwell offered the 18.44 train to Southerham Junction and Signalman Russell accepted it at once. He sent 'Train entering section' at 19.07 and received the 'Train out of section' bell signal from Southerham Junction at 19.09. The next Down train was the 19.01 Lewes to Seaford, which was ready to depart, so Colwell immediately offered it and it was accepted. Very shortly after the exchange of these bell signals at 19.09, he received a telephone call from Russell to say that there had been a derailment at the junction and that the emergency services would be required. Russell said nothing about the circumstances of the accident or its possible cause. I questioned Signalman Colwell about the time of '2-minutes' between his sending the 'Train entering section' signal for the 18.44 train and his receiving the 'Train out of section' signal. He told me that the time interval was normally between 2 and 2: minutes and on occasions was as little as a minute. I pointed out that the distance from Lewes to the clearance point at Southerham Junction was just over 1: miles and that timings of 2 minutes and one minute represented average speeds of 38 and 75 mile/h respectively. He agreed that for a train starting from Lewes this seemed too quick and that he had thought on occasions that the signalman at Southerham Junction might be giving the 'Train out of section' signal before the train had actually passed the clearance point. He had not, however, mentioned this to anyone. As he said to me, "provided the signalman gave the 'Train out of section' bell it was no concern of mine". Mr. A. C. Foreman was the Station Manager at Lewes. During his routine visits to signal boxes he had observed Signalman Russell at work and considered him to be a fully competent signalman. He had examined the Train Register at Southerham Junction on occasions before the accident and whilst there were variations in the train passing times these had not seemed significant and gave no indication of irregular practices. He had seen no evidence, either at Southerham Junction or elsewhere, that the release key might have been used irregularly. Before the junction was repositioned in April 1976, Mr. Foreman had discussed the new Instructions for Southerham Junction Signal Box with his Area Inspector and the latter had then explained them in detail to all the signalmen concerned. Later, Mr. Foreman had himself discussed the instructions with the signalmen during the course of his visits to Southerham and everything had appeared to be straightforward and well understood. There had, however, been some 'safe-side' failures of the equipment following the repositioning of the junction, these mainly affecting Nos. 10 and 11 points. The failures had either been in the signal box indications or a failure of the points to go from reverse to normal or vice versa when the controlling lever was operated. The last fault recorded before the day of the accident had occurred on 10th May. On this occasion the signalman had signalled a Brighton to Seaford train through the junction but had then been unable to get a normal indication when he attempted to re-set No. 10 points for the main line: on being called, the signal technician had found that the points had not closed properly. On the day of the accident, Mr. Foreman was informed of the derailment at 19.45. He arrived at Southerham Junction Signal Box at about 20.00 and questioned Signalman Russell about the protection of the obstruction. All the levers were in the normal position in the frame except for No. 11, the Branch points lever, which was in the reverse position. Russell, who seemed somewhat excited but otherwise fit to continue his duties, said that he had not moved any of the levers since the accident. Mr. Foreman also observed that the release key was not in its normal position on the instrument shelf but was inserted into the keyhole of the block instrument. At this time Area Inspector Roberts arrived and Mr. Foreman left to go to the junction and to check that the passengers had been looked after. On returning towards the signal box shortly afterwards, inspector Roberts called out that he needed an ambulance as Russell had apparently collapsed. Help was obtained and Russell was taken to hospital. Mr. Foreman next went to the junction where he observed that No. 10A points were fully reversed, that is set for the Seaford branch. They were apparently undamaged and fitting properly against the stock rail. He made a note of the visible damage to other parts of the junction. The following day, Signalman Russell reported for duty having been discharged from hospital, and submitted a written report in which he said that he had used the release key to obtain an early release for the 18.44 train. Mr. Foreman arranged for Russell to be given a medical examination by the Railway Medical Officer: this was done during the next day and Russell was certified as fit for normal duty. Area Inspector K. Roberts was 'On Call' for the area that included Southerham Junction. He was off duty when he heard about the derailment and he went straight to the signal box, arriving at about 19.30. Russell told him that as the 18.44 train was passing over the junction various track circuits had shown 'occupied' and someone had then telephoned to say that the train had been derailed. Mr. Roberts noted that all levers were normal in the frame with the exception of the lever for No. 11 points which was reversed, and that the release key was in the key hole. He did not question Russell further at this stage since he was concerned about the passengers in the train, but after going down to the junction he returned to the signal box and asked Russell why the key was in the keyhole. The signalman said that he had used it to obtain an early release for previous trains but he denied having used it for the 18.44 Brighton train. Having made this denial he then held his head in his hands and appeared to 'go to pieces'. Mr. Roberts called to Mr. Foreman, who was returning to the box and Russell was taken away in a state of shock. During his visit to the junction, Mr. Roberts noted that No. 10 points were set for the Seaford Branch. The facing end, No. 10A, was correctly set and fitting properly and the switch diamonds appeared to have been correctly set but had been damaged by the derailment. Later in the evening and during the night Mr. Roberts collaborated with the Divisional Signal Engineer's staff in investigating ways in which the derailment might have been caused. These aspects are discussed later in the Report. In his evidence, Mr. Foreman commented on failures of the signalling equipment before the accident. Further evidence on the history of equipment failures at Southerham was given by Senior Technician R. J. Brown. He explained that, before it was replaced, the old junction and its associated signal ling had given the kind of troubles to be expected with old equipment: in particular the treadle associated with the back locking of the home signals had given a lot of trouble and this had meant that the signalmen had frequently had to use the release key to free the back-lock, this being a quite proper use of the key. Since the renewal and repositioning of the junction there had been the usual teething troubles but the number of these had been declining and all the failures had been 'safety-side'. So far as the points were concerned there had been occasions when the point blades had not closed properly hut on these occasions the absence of proper detection had indicated to the signalman that something was wrong and had prevented him from clearing his signals. Mr. Brown confirmed that at the time of the accident there was no-one working on the signalling equipment in the Southerham area. Signalman S. M. Russell, who was aged 20, told me that he joined the Railway in 1971. After training as a signalman in Lewes Signal Box he was appointed to Southease. He also worked for a time in Newhaven Harbour Signal Box, where there are power-operated points, before taking over from Signalman Colwell at Southerham Junction in September 1975. On the weekend before the accident he had finished work at 14.00 on Saturday and was then free until working the 14.00 to 22.00 turn on Monday. He got a proper night's sleep and booked on duty at 13.45 on Tuesday, the day of the accident. At first, everything was normal except that trains were running slightly late because of engineering works on the Seaford Branch, but during the rush hour delays began to occur and some trains were running 5 or 6 minutes late. One train that was running late was the 17.51 from Victoria and immediately this had gone by he was offered the 18.44 Brighton to Ore train: the time was 19.05. He accepted it at once and received the 'Train Entering Section' bell signal from Lewes. By this time, the Victoria train had not cleared Glynde so he went to the Home Signal lever (No. 1) and waited until he could see the Brighton train approaching the signal slowly before clearing it. The train passed the signal box travelling at about 15 mile/h and when its rear end was some 20 yards past the signal box he operated the release key. This enabled him to replace Signal No. 1 to Danger and to give 'Train out of Section' to Lewes, which he did. He was at once offered the next train, which was the 19.01 Lewes to Seaford, and be accepted it. Russell admitted that he had known at the time that operation of the release key in this way was completely against the rules: he had used it in order to speed up the flow of traffic and to help clear the congestion which he knew from his own previous experience would be occurring at Lewes. He further admitted that he had irregularly used the release key on two other occasions earlier during the shift, near the beginning of the rush hour, and that there had been other occasions, on other days, when he had used the key irregularly. Shortly after the train had gone out of sight towards the junction numerous track circuit indications in the junction area became illuminated on the diagram. Russell telephoned Control to report that all the track circuits had failed and then spoke to Colwell at Lewes. The latter asked him why he was taking so long to clear the Brighton to Ore train and Russell told him about the track circuit indications. Russell was sure that this was the one and only occasion on which he had spoken to Colwell that evening. Shortly afterwards the guard of the train arrived at the box and said that his train had been derailed. Russell told me that there had been occasions when, if a Seaford train was following one signalled on the Eastbourne line, he would hold No. l0 points lever and wait for the track circuits to release the lock on the lever so that he could at once reverse the lever in order to set the junction for the Seaford direction. In his evidence at the Railway's own Inquiry Russell was more or less prepared to admit that he might have similarly gone to No. 10 lever after he had accepted the Lewes to Seaford train, expecting it to be locked, but found that it moved out of the frame as soon as he grasped it. However, at my Inquiry, whilst conceding that he might possibly have acted in this way and that setting the route for the Seaford train was the next thing he would normally do, he told me that to the best of his recollection he had not touched No. 10 points lever at all. Since in giving evidence he had appeared uncertain about the precise details of the interlocking at his signal box I questioned Russell about the alterations that had been made to the signalling. He told me that he had been on sick leave when the junction was repositioned and that when he returned to duty a Relief Signalman who had been covering his job explained the changes in such things as the clearance point and pointed out the new Signalman's Instructions which had been issued on 4th April. No revised locking tables had been provided in the signal box and he could not be sure whether any Inspectors had visited the box to discuss the changes. Area Inspector G. Milton had been concerned with the training and subsequent supervision of Signalman Russell. Having attended a 3 weeks course at the signalling school, Russell was passed for the Southease box and on this occasion Mr. Milton had advised him to study the Rules further as he was not quite up to standard in this respect. His knowledge had improved when Mr. Milton later passed him to work at Newhaven and he appeared to be a completely competent signalman, both then and later when he transferred to Southerham Junction. After Russell had returned to work following the signalling alterations at Southerham, Mr. Milton had visited him on a number of occasions and was satisfied that he was working correctly. He had never had reason to suspect that he was using the release key irregularly. The signal box had not been supplied with new locking tables showing the altered interlocking because these had been in short supply: Mr. Milton said that it was normal practice to have the tables in a signal box and he would normally expect a signalman to know the details of the locking. Evidence on the examination of the track at the junction was given by .Mr. W. G. Grant, the Divisional Civil Engineer. His Permanent Way Assistant had arrived on site at about 21.00 and had found that the facing points, No. IOA, were set for the Seaford Branch. The left hand switch tongue was fitting properly to the stock rail but marks on this switch and on the back of the right hand switch tongue made it clear that wheels had passed on the wrong side, this being confirmed by damage to heel blocks, timbers, and a stretcher bar. The gauge at the tips of the switch was correct. Taken with the evidence of marks on the wheels of the trailing bogie of the second coach of the train it seemed that the switches were partly open as this bogie arrived on them and that after striking the partly open, and possibly moving, switches the bogie was diverted to the Seaford direction. The Divisional Traction Engineer carried out an examination of the train soon after the derailment. He concluded that the trailing bogie of the second coach was probably the first to become derailed. Apart from damage caused by the derailment the rolling stock was in satisfactory condition and nothing was found which might have contributed to the accident. The Divisional Signal Engineer, Mr. T. Cracket, arrived at Southerham at about 22.30 and personally supervised the testing of the signalling. Apart from obvious damage to cables and equipment caused by the derailment and which had caused most of the track circuits to show occupied on the signal box diagram, the detailed tests showed that the controls and interlocking were functioning as designed. In particular, the cables linking No. 10 lever to the point motors bad not been damaged in any way and were in perfect order. Mr. Cracket carried out tests to see whether there was any way in which the points could have moved from the normal to the reverse position without No. 10 lever being reversed in the frame, but no possible way was found, assuming that there had been no deliberate interference with the electric locks in the signal box. At the end of his tests, and with the knowledge that the signalman had probably used the release key, Mr. Cracket concluded that No. l0 lever must have been out of the normal position before the train reached track circuit 'C' and that it was subsequently moved sufficiently to operate the point motors either just before or just after the train had occupied this track circuit. It had then either been replaced to normal without the reverse lock position having been reached, or it had been fully reversed and subsequently restored to normal by a release of the electric lock. Mr. Cracket thought the latter the more likely. In the Southerham box access to the electric locks was relatively easy: they were positioned just behind each lever and secured by nuts which, because of the signalling alterations that had recently taken place, were in most cases only finger tight at the time. There can be little doubt about the way in which the train became derailed: all wheels of the first coach and those on the leading bogie of the second travelled correctly over No. 10A facing points and took the route to Eastbourne. When the wheels of the trailing bogie of the second coach arrived, the points were either standing open or were actually moving and the bogie was forced onto the Branch line and into derailment. Track circuit 'C', which when occupied locked the points lever in the frame, commenced 102 feet before the toe of the facing point switches, and if Driver Mullett's estimate of the speed of his train as it approached the junction (35 to 40 mile/h) is correct the train would have covered this distance in almost exactly 2 seconds. Since movement of the points from the normal to the reverse position took about 3.5 seconds (as I verified for myself on site before the public inquiry) it is almost certain that movement of the points must have started whilst the train was already occupying track circuit 'C'. From Mr. Cracket's evidence the only feasible way in which this could have happened was for No. 10 lever to be out of its normal position in the frame by at least 2 ½ in at the moment the train reached track circuit 'C'. The train's speed as it passed the signal box was estimated by Driver Mullett to be about 35 mile/h. Signalman Russell thought its speed at this point was not much more than 15 mile/h. Even at the faster speed the train would have taken about 26 seconds to travel from the signal box to the junction and this would certainly have allowed Russell ample time to operate the key release, replace No. 1 signal, exchange the bell signals with Lewes and move to No. 10 lever in order to reset the route for the following Seaford bound train Going through the various actions required, Mr. Cracket estimated that it would take a signalman about 20 seconds from the time he operated the key release until he was ready to operate the points lever. The near coincidence of these timings is significant. I believe that the derailment of the 18.44 Brighton to Ore train was caused by Signalman Russell moving No. 10 lever out of its normal position in the frame immediately prior to the train occupying the approach locking track circuit, track circuit 'C', and subsequently moving it to a position where the facing point motors started to move the points under the train. He was able to move No. 10 lever in this manner because he had released the interlocking between the Home signal and the point lever by irregularly using the key release for the Home signal. I think it most likely that, having used the release key and replaced the Home signal to Danger, he gave 'Train out of section' for the Brighton to Ore train well before it reached the specified clearance point (the Glynde end of track circuit 'E'), accepted the Lewes to Seaford train, and then grasped No. 10 lever preparatory to setting the junction for the Seaford direction. He was expecting it to be locked and intended to hold it against the lock until clearance of the controlling track circuits by the Ore train released it but found that it was free and that it moved to a position where the point motors started to operate. From this point on he either replaced the lever to normal or pulled it to reverse, when it would become locked, and subsequently released the electric lock so as to return the lever to normal in an attempt to disguise what he had done. In coming to this conclusion I have considered Signalman Russell's denial at the public inquiry that he touched No. 10 points lever after irregularly using the release key. I have considered it in the light of Mr. Cracket's evidence in the light of Russell's own evidence at the internal Railway Inquiry when he as-good as admitted that he had inadvertently operated No. 10 lever, and with the background of his conduct immediately after the accident. I find myself forced to reject his denial which he may have made in good Faith having persuaded himself after the event that he had not touched the lever. In fairness to Signalman Russell, his misuse of the release key, which he had probably learned from others in the first place, was most likely a misguided attempt to help speed the flow of traffic. It may also have been partly motivated by his previous experiences with Signalman Colwell who, as an older and more senior signalman, had probably 'chased' him on more than one occasion in the past when he suspected him of slowness in clearing trains. Nevertheless, he knowingly disregarded the clear instructions governing the use of the release key and, more seriously, he broke the Rule (C.4.5.2) which required him to delay replacing his home signal until the last vehicle in the train had cleared the junction points. Such conduct on the part of a trained signalman is inexcusable. With the closure of Southerham Junction Signal Box and the replacement of the old semaphore signalling by modern colour-light signals controlled from a route-relay panel at Lewes, this type of accident will not occur again at Southerham Junction. Other signal boxes, however, will remain where key releases will continue to be a necessary feature. In theory, it would be possible to devise additional controls to reduce the risk of a signalman's misusing the release, but I cannot see how this could be done simply or cheaply. Nor do I consider that the risk justifies any significant expenditure or is of a kind that needs additional safeguards. As Lt. Col. McNaughton wrote in his report on the not dissimilar derailment at Connington South in March 1967: "Electrical and mechanical locking of points and signals is provided as a protection to a signalman, to prevent his unwittingly setting up an unsafe situation as a result of his forgetfulness or carelessness. It is not intended to be proof against deliberate circumvention . . . . . nor is it necessary or practicable that it should he so." The accident at Southerham Junction was an isolated case of a signalman disregarding well-understood rules and being led thereby into dangerous error. That this is so is shown by the fact that accidents caused by irregular block working by signalmen are now rare-during the whole of 1974 and 1975 no accident at all was attributed to this cause, and during 1976 there were only three cases, including the one at Southerham Junction. As with any activity where safety depends on a rigid adherence to rules and regulations, the main safeguards lie in the selection and training of the individuals concerned, their subsequent integrity and self discipline, and on proper supervision. So far as I could determine during the course of the Inquiry there were no obvious shortcomings under any of these headings in the Lewes area. It was perhaps unfortunate that, for various reasons, the interim arrangements at Southerham following the repositioning of the junction had to remain in being much longer than had been originally planned but this in itself should not have produced any danger: it only extended the time during which things could go wrong.